The pidyon haben ceremony is steeped in tradition. The infant is placed on a tray, surrounded by sugar cubes and garlic*, and draped in the gold and jewels of the women in attendance. The ceremony begins with the father ascertaining that the child is his firstborn son. After the father ascertains the fact, the Kohen asks – what do you prefer – to give me the child or to redeem him? The father responds that he wishes to redeem the child. The father then makes two blessings – one on the commandment of Pidyon Haben, and the Shehechiyanu, which is recited at festivals and when a person performs a mitzvah for the first time. 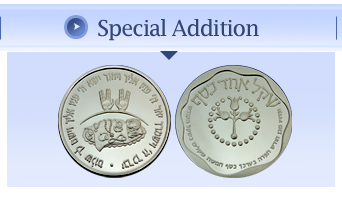 The father then gives the Kohen five silver coins. The Kohen blesses the child, and makes a blessing on a cup of wine. 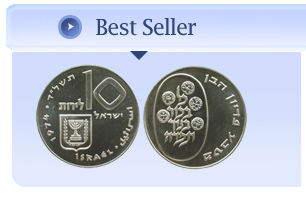 The coins given to the Kohen must equal the Biblical five shekalim of silver – an amount determined by the Chazon Ish (L'Chumra) to be 96 grams of pure silver. 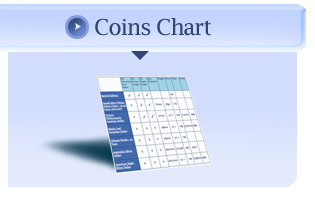 Pidyon Haben Coins offers you the opportunity to purchase beautiful coins for this special event. *The sugar cubes and garlic are distributed to the guests. The reason sugar and garlic are used is because according to tradition, it is a great segulah to eat food that was served at a pidyon haben. Sugar and garlic are easy to carry and easy to use, so that the families of those who participated in the Pidyon Haben can also benefit from the blessings they brings. There is a tradition that eating food served at a Pidyon Haben is as great as fasting for forty days!